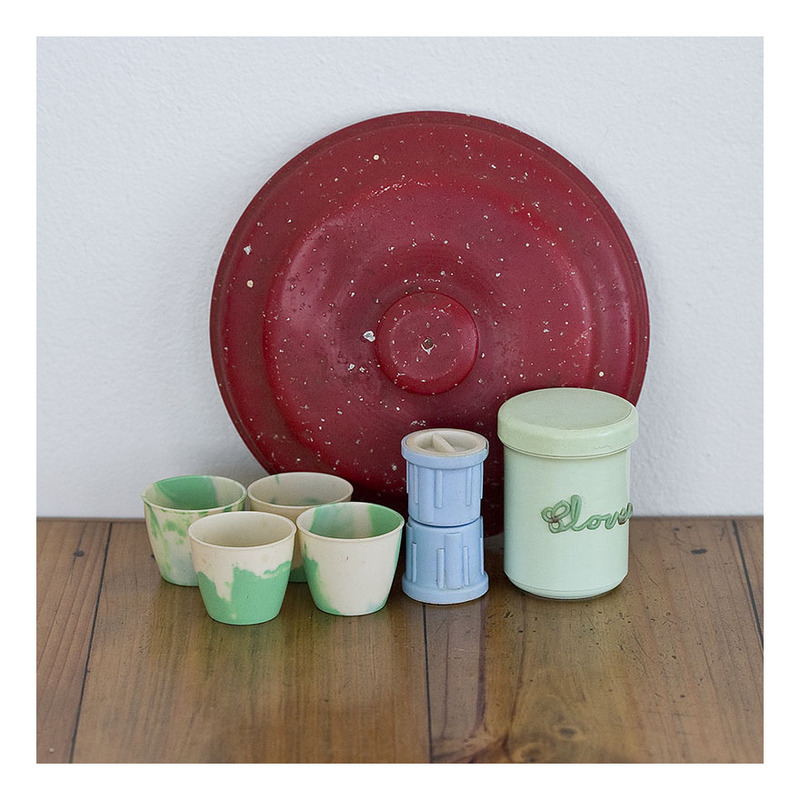 I love bakelite and have collected Australian bakelite domestic ware for some time. Nally first started bakelite production in 1923 and was one of the first in Australia to do so. The factory was just up the road from where I now live. These two mixing bowls – although nested [that is fitting exactly within one another]- were priced and sold separately. Nally’s advertising blurbs of the time made much of the fact that replacement pieces could always be bought, and as the mixing bowls were ‘harlequin’ [ie: different colours] they could be mixed and matched. 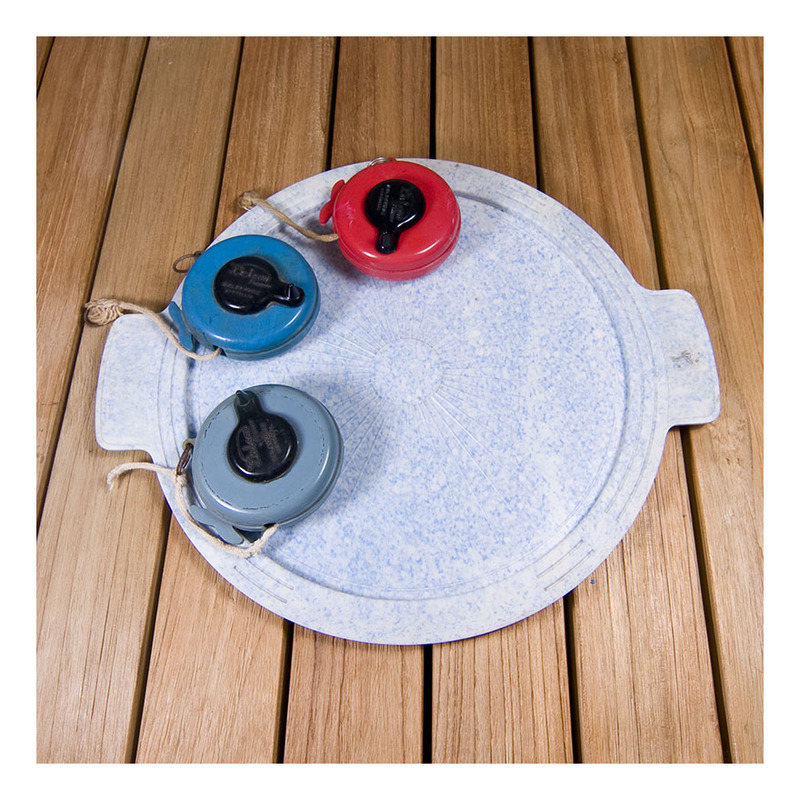 The mixing bowls have a pouring lip, and came in the usual 40s pastel colours of blue, green, pink, cream and white. These bowls are yellow; and I’ve teamed them with a kewpie doll from the same era. Here is a collection of red and red & white bakelite spice canisters, all Australian made, in the 1940s. The front six canisters- two with sprinkle tops, are by Sellex; Nutmeg, Cloves, Ginger, Cinnamon, and one [indecipherable] other. The two canisters at the upper left are by Marquis, and the pair of canisters adjacent are by Nally. All good Australian bakelite canister manufacturers. All the canisters have screw lids – which are all in good order. The labels to the Sellex canisters show vintage wear- after all, they are over 75 years old. I have a set of matching kitchen canisters by Eon – also red and white- this colour combination is a winner- see posts, below. And now for some more bakelite domestica! This lovely speckled blue and white bakelite tray has distinctive art deco styling, with its embossed sunburst pattern. The speckled form of bakelite was often used with blue pieces- it has been noted previously [see ‘blue bakelite post, below] that blue bakelite is prone to break down to a murky brown colour. One solution was to mix the blue bakelite with another colour- usually a neutral colour- to help disguise any such deterioration. The tray has performed well at many cocktail soirees, and I can attest to the understated glamour it brings to any occasion. The three retractable washing lines are also very cute. They were made for the interior hanging of clothes. Being retractable meant that one could wash and hang clothes on a rainy day, or it was used when travelling. The winding mechanism is working well on all three – and I like that the manufacturer’s name is cast into the contrasting bakelite winding handle. One could certainly use them today – for retro travel in style! I recently found another retractable clothes line: this one is plastic, later in date, and made in England; coloured beige and green. The mechanism is exactly the same, but the handle has been modified- this is a 50s version. Surely there is a collector of indoor washing lines out there; Washingalia? Further to my life-long quest to collect every known coffee canister – here is one posing as a coffee house. 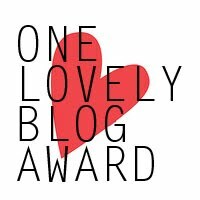 I’ve styled it with a Nally plastic coffee canister – Australian – of the same vintage. It’s interesting [to me anyway] that coffee wasn’t a big deal in the 60s – so that the canisters were smaller usually than tea- the bigger sized canisters in nested sets always belonged to sugar, rice and flour. Nowadays- I expect- sugar would be the smallest canister and coffee the largest! Anyhoo- I like the idea of putting all my various single origin and coffee blends in different, miss-matched vintage coffee canisters. So far, all canisters- both plastic and ceramic- are roughly the same size – and just so happen to fit a bag of 250g coffee. So maybe those 60s canister makers did know what they were doing! I have previously posted bakelite salt and pepper shakers – twice- first in a grouping of green examples and then in a grouping of multi-coloured examples. Here we have a collection of red s&p. They were made to be included in the picnic basket- an everyday object made in a newly-developed plastic- that wouldn’t break in the great outdoors. I am very fond of the ingenious design of the first two shakers – the top and bottom separate to reveal the two shakers; and you can see that the screw-on bases were often different coloured bakelite. These shakers were made by Marquis; and are impressed with ‘cat 729’. The next pair of shakers were made by Nally: they are quite distinctive with black bakelite screw lids; and the last set of shakers- although not marked, are by Eon. For bakelite collectors, and salt and pepper shaker collectors- you know who you are! Here we have green & cream bakelite kitchenalia from the 40s – the bread board [with incised ‘BREAD’ script] was made by British Plastics, in Melbourne; the salt canister was made by Industrial Plastics in Adelaide, and the canisters are by Nally, in Sydney. The large Flour canister houses nested canisters inside – each with that fantastic cursive script; they are ‘Sugar’ and ‘Coffee’. I have waxed lyrical about the olden days when coffee canisters were the smallest – and how nowadays they would be the largest. So, ok, won’t belabour the point. The salt canister has overt deco styling, despite being made in the 40s – and it is in good vintage condition and ready to hang. The bread board has never been used, and so has no cuts or abrasions – and the Nally canisters- an incomplete set of five – are also in excellent vintage condition. These are the odds and ends of my Nally bakelite collection. Nally first started bakelite production in 1923 and was one of the first in Australia to do so. The factory was in Glebe, in inner-city Sydney – where I once lived as a student, when it was grittier with light industry, warehouses and terraced housing. Anyhoo- in researching resin I looked at early polymer precedents and then became fixated on bakelite. Australia was just coming of age in the 20s and bakelite was taken up with great fervor- it was the modern, new era- cheaply produced alternative to timber, iron, steel and ceramic- you name it. I’ve teamed the Nally bits ‘n’ pieces with an old battered red aluminium canister lid, much splattered with paint. It’s had a hard life and has lost its companion piece and now must do duty as a background element. Still- that’s upcycling at its best! Tea canister, round blue- Nally. I do have whole canister sets- and have posted them previously, but it’s also good to mix and match canisters. 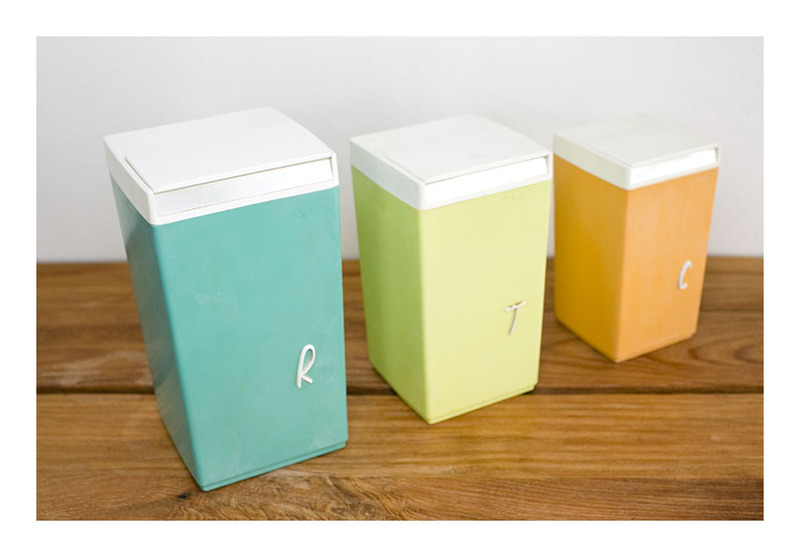 The canisters do double duty providing storage as well as adding much needed colour. The red lid canister holds takeaway pamphlets whilst the tea canister holds – tea. Colour coding at it’s best! Here we have the R [rice] T [Tea] and C [coffee] containers- made from the new-fangled rigid plastic moulding process in the 60s by Nally. A new innovation, rigid moulding went on to replace bakelite in the production of kitchen canisters. This would have been originally a set of 5: the F [flour] and S [sugar] having gone AWOL. 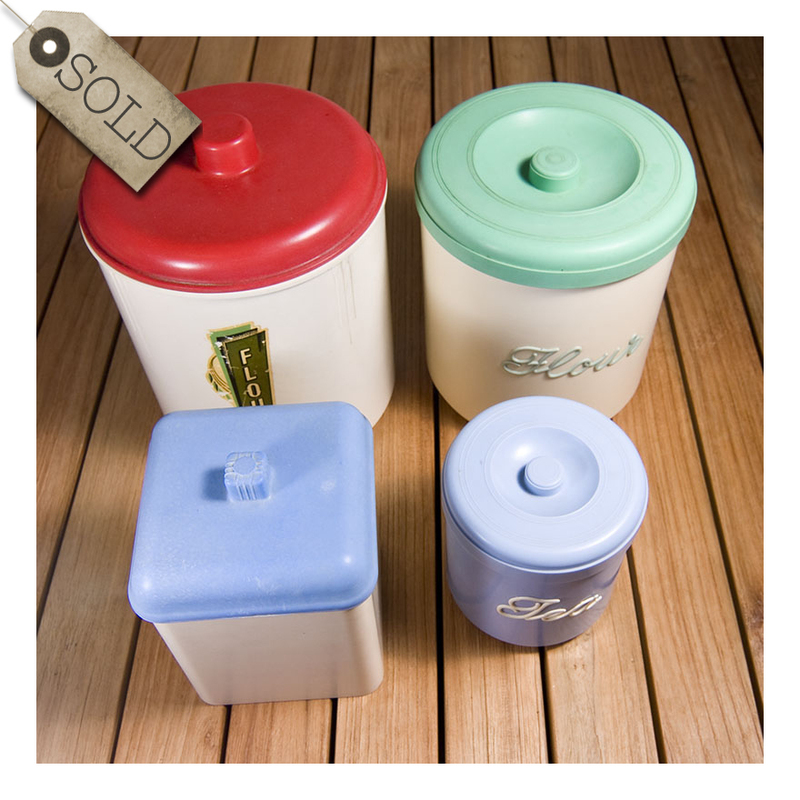 Whatever, kitchen canisters are still highly collectible. I like to think the RTC set stands for Real Time Capacity. Or Regional Transport Commission. It’s up to you what you store in the R, T, C canisters. Roses, Tiramisu, Candy. Just some suggestions.